Cataract Engine & Hose, Goshen's first fire company, traces its origin to the year 1843. In that year, trustees of the newly incorporated Village of Goshen authorized the founding of a fire company, after two serious blazes that virtually destroyed several Main Street buildings in the area today known as "Lawyer's Row". On August 29, 1843, Company Number One, originally names "Goshen Hook & Ladder Co." accepted its first ten men, under Foreman Joseph D. Pardee. Additional line and executive officers would be added in later years, and the title Foreman would change to Captain in 1923 but, for the time, Foreman Pardee was in charge of ten men, some leather buckets, pike poles, and tow or three cumbersome ladders. One month after these auspicious beginnings, voters approved the expenditure of $450 for the purchase of Goshen's first fire truck - a hand-pulled and pumped black and gold beauty, resplendent with hand-carved wooden Indians which are all that remain of the Metamora, the secondhand dandy that blew a brass cylinder and collapsed on June 5, 1855, after a dozen years of service. Within months of the company's formation, the Village approved a name change for the new firefighters and, on January 2, 1844, they became "Orange Fire Company Number One". In the following years, the community experienced a fortunate lack of fires and a corresponding dwindling interest in firemanics and by 1879, reorganization became necessary. With the overhaul, there came still another name change for "Old Number One" and, on June 8, 1849, it became "The Goshen Fire Company". The 1849 reorganization brought with it the addition of new officers. First Assistant Foreman - L.I. 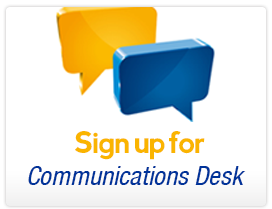 Winans; Secretary - S.H. Strong; Treasurer - Wm. Sayer; and Steward - A. Payne. When "Metamora" broke down in 1855, she was replaced by a more substantial dreadnought - still a totally hand-operated device. The manufacturer's enthusiastic name for the new truck was most impressive - Cataract - (Webster defines it as a large waterfall). So impressive, in fact, that the firemen took the name for their own and in 1856 became "The Cataract Engine Co."
A full fourteen years after its formation, the company erected its first firehouse, a wood frame structure near the site of the present Main Street station. The total cost for the new building in 1857 - $125! 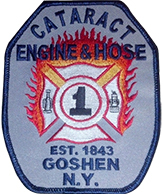 In 1866, at the Village's request, the Cataracts absorbed a faltering Protection Hose Co. and the metamorphosis of the company name became complete, as we know it, The Cataract Engine & Hose Company Number One - Goshen, NY. In 1873, the company added a Financial Secretary - M. Lundy; then in 1875 was added Second Assistant Foreman - John Dougherty and so the line officer staff became complete as we know it when, in 1923, the Foreman and his assistants officially changed their titles to Captain, First Lieutenant, and Second Lieutenant. In 1886, the Company was overhauled again; this time they kept their name intact but added the executive office of President - Wm. H. Wyker and that of Chaplain Robert Bruce Clark. The Cataracts flourished under the good Mr. Wyker and by 1891 were able to afford spending over $1,200 for new dress uniforms. So it was that on October 6, 1892, a thoroughly drilled Cataract Co., accompanied by the Goshen Cornet Band, paraded in Newton, NJ, the guest of the Town's Kittatinnies. The visit was recorded for history by the respected periodical, "The Deckertown Independent", which said, "To drop into slang - Cataract Hose of Goshen, knocked the spots off anything in the way of firemen that ever stepped in Newton, and are entitled to the cake and the whole bakery as well...". After that, the columnist warmed up to the subject and went on to describe in flattering detail, the uniforms, the maneuvers, and Spartan appearance of the Goshenites. The Sussex Register described the very same vision as "the cynosure of all eyes...no more natty uniform could be suggested...and the marching - well, it was like clockwork." and so on ad delirium. To this day, all three Goshen Fire Companies vigorously carry on the proud marching tradition. Aside from the fun of parades and other social functions, Cataract Company's history records a number of actions in the tradition of service. March 7, 1913, Cataract hand-pumper to Montgomery, NY, a Mutual Aid call to fight a blaze in the local jail and other buildings. The Erie Railroad supplied an engine, coal tender, flatcar for the pumper, and a caboose which accommodated the entire Goshen force, but not receiving Chief Hock's personal check for $50 to cover the cost of this mercy mission. Other reminiscences of past glory include the blizzard responses to Middletown and Washingtonville with the Cataract's first motorized truck, an American LaFrance, chain drive, hard tire rear wheel brakes, no windshield, powerhouse. These were men of steel, anything less would have rusted and shattered under those conditions. In 1971, the Cataract Co. purchased and gave to the Fire District a 7,000 gallon tanker powered by a Mack "Maxidyne" tractor. Total cost for the Supertanker exceeded $10,000 but it cost local taxpayers nothing, and it significantly improved fire protection in outlying areas not serviced by water mains. With the creation of additional fire companies in 1871 and 1873, Goshen also created an additional office - Chief Engineer. On December 18, 1871, when Rescue Hook & Ladder Co. was formed, Charles Elliott, a Cataract, was appointed the department's first Chief. Finally, in 1901, the Cataracts formed its first Fire Police detail under James W. White. Today, five Cataracts join an equal number of Minisinks and Dikemans in the District Fire Police unit. 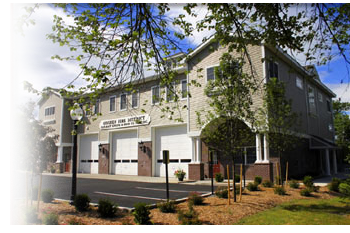 Today, the Cataracts are enjoying over 175 years of service to the Goshen community and have moved into their new firehouse on Green Street 2004.